So Merry Christmas! I’m feeling in as much the spirit as is reasonably possible. I’m wearing teal striped PJ’s which my mum said looked a bit like the ones the boy in ‘The Snowman’ was wearing, and my socks have baubles on! 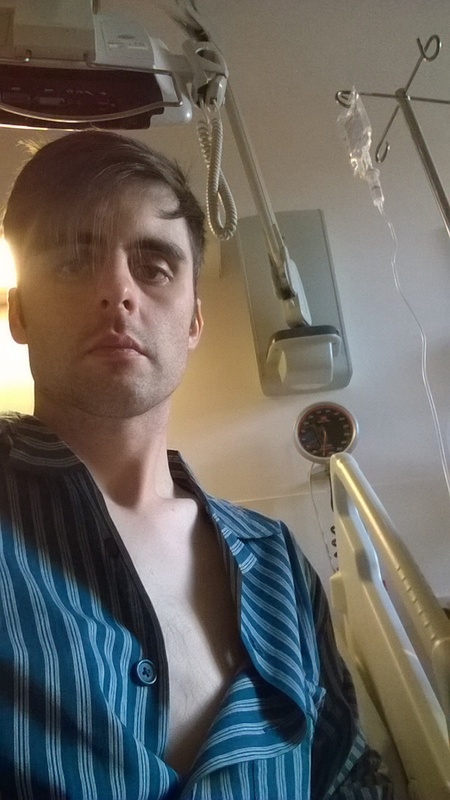 Yesterday was pretty tough going but not anywhere near as difficult as I thought; I was due to have an intrathecal injection (through the spinal column) but that has been delayed due to shortage of staff. This chemical is from a group of chemicals called ‘monoclonal antibodies’ which can accurately pinpoint specific cells via proteins. In this case, as my cancer is related to ‘B-lymphocytes’ which have a protein spot called CD20, the manufactured antibodies attach to this compound so that my body can break down and destroy these cells. The downside, is that at the same time, they attack good cells (which my body will eventually replenish) this can lead to certain side effects. Although this is a very effective treatment, it can lead to allergic reactions such as itchy rash and sickness. I was also given an antihistamine to reduce this risk. During infusion, the nurses start the drip very slowly and take observations at 30 minute intervals to check how I’m coping. If all is well, they notch up to the next flow rate and so on. To start with I felt fine, but after about the 3rd hour, I started getting short breath, light headedness and my blood pressure had dropped slightly so they continued at this rate for a while. I also experienced some severe stomach cramps which I’m told could be due to the growth receding and my bowels moving around. The drip lasted for about 7 hours, and by the end all I was feeling was a little light headed and lethargic. Finally I was given a bag of cyclophosphamide, this is one of the main chemicals used in my treatment and most of the days of my schedule I will be having this. This drip lasted for an hour and at the end I was starting to feel quite tired. I watched Skyfall on ITV and then was given a sleeping tablet to help me drop off! Today the schedule is thankfully a little more relaxed, I’ve had the usual pre-meds and tests, and I am due to have another round of cyclophosphamide in a moment. This should last for about an hour. I’m still a little tired this morning and felt a little dizzy coming out of the shower but I feel much less pressure around my abdomen. I opened my bowels this morning too which as ridiculous and disgusting as it may sound, was probably the most comfortable passing I’ve had for weeks. I will regard this as the first Christmas present of the day! anyway, that’s me for today- wishing everyone a merry Christmas.